Have you ever been asked “Do you take the Bible literally?” Before answering, you would be well-advised to pause and consider your reply. To the one asking the question it is a simple yes or no answer. If yes, then he will rightly point out verses that, if taken literally, have clearly dangerous results. Take Mark 9:42-48, which tells Christians if their hand or foot causes them to sin, they should “cut it off”, and if their eye were to cause them to sin, they should “pluck it out.” If you were to take this literally you would participate in self-mutilation. On the other hand, if you answer “No” then as a figurative book it is plain to see that any person’s interpretation is as good as anyone else’s. So then, how would you go about answering your friend’s questions? ​First let us realize that the answer is not a simple “yes or no” answer; because within sacred writing there are eight forms of literary speech used. Some of these by nature would seem to exclude the possibility of figurative language; these include laws and historic writing. While other methods such as poetic and dramatic (Song of Solomon) use figurative language very frequently. So how can you give a Yes or No answer? You can’t, but you can explain the use of both Literal and Figurative writing within God’s word. ​E.W. Bullinger wrote: “whenever and wherever it is possible the words of Scripture are to be understood literally.” The word of God must be translated literally if possible. If not, then move onto figurative language. When God spoke it was in real life situations not in a fairy tale, thus the Bible views itself as a non-fiction book. When the writers cite other persons in Scripture they site them as real. For example, Jesus referred to Jonah in Matthew 12:39 as a sign of His resurrection; the writer of Hebrews lists many great men and women of faith (Hebrews 11) as examples to the believer. Nowhere is the story of Moses or David seen as anything but factual, therefore one writer wrote “the Bible itself gives a witness that it should be taken at face value.” Scripture interprets scripture literally. But as we have noted there are figurative writings in the Bible; most commonly in four forms. Metaphor, which is a comparison by direct statement, John 5:1, “I am the true vine” Jesus was not a literal vine but he could be compared to one; a Simile, which is a comparison by the use of words “like” or “as” Exodus 24:17, “The glory of the Lord was like a consuming fire…”; a Hyperbole is an exaggeration for emphasis, for example John 21:25, “And there are also many other things that Jesus did, which if they were written one by one, I supposed that even the world itself could not contain the books that would be written.” And finally used most commonly in the Old Testament is the figurative writing known as Anthropomorphism, which is attributing to God human characteristics such as in 2 Chronicles 16:9. 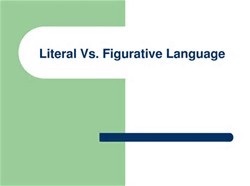 So as we see the use of figurative language does have its place in scripture, but only when certain factors indicate that the passage in question is not meant to be interpreted literally. ​Therefore the correct answer to the question presented to you should be, If possible I take the Bible to be literal, although at times where a literal translation is not possible I then turn to the figurative sense. Because both can be found in the Bible. ​“Therefore we ought to give the more earnest heed to the things we have heard lest at any time we should let them slip”(KJV). The Greek translation of the phrase “let them slip” is translated “lest we haply drift away from them”(ASV). The first word in this verse “therefore” refers to the previous chapter—Hebrews 1. In chapter 1, the writer of Hebrews points out that Jesus Christ is the greatest messenger ever to exist of the Almighty God, far greater than even the angels. We find in John 1:1 that in the beginning, the Word was with God. Jesus is that Word according to John 1:14. The words spoken by Christ are the Word of God, holy and inspired. So the things we have heard in Hebrews 2:1 are the things which Jesus spoke to us when he came to this earth, things that are now written down and comprise what is the inspired word of God. The writer tells us we should hold to the things we have heard, lest at any time we should let them slip. Keep in mind that the writer is referring here to whom he wrote the letter to. In those days, many who had obeyed the gospel had begun to reject it and turn back to the old law. The writer reminds these brethren that there is no hope of salvation under the old law. Only under the New Testament which Christ died so it could be established, can anyone attain eternal salvation. The writer points this out in Hebrews 2:3 where the scripture says, “How shall we escape, if we neglect so great salvation: which at the first began to be spoken by the Lord, and was confirmed unto us by them that heard him;”What we should pay attention to here is that we cannot escape sin and the second death if we drift away from promises of Christ. The greatest promise given to us is salvation from sin through Christ Jesus. If we neglect or let slip that great promise, we have no hope of salvation. The only thing that anchors our soul to Christ is that hope of salvation through Him. Brethren, there are too many of the Lord’s church who don’t value the importance of the hope of salvation. This is why we have members who are lax in their everyday lives and their worship to God. As long as this is the case, God’s people will continue to drift further and further away from Him. It’s like being in a boat near land. Unless a person anchors near the shore, the vessel will drift until land is no longer in sight. When this occurs, the hope of going ashore is lost. So is the case with the Christian. If we don’t anchor our soul to Christ, we will drift away! Hebrews 6:19 says, “Which hope we have as an anchor of the soul, both sure and stedfast, and which entereth into that within the veil;” The hope spoken of here is the hope of salvation. It is the anchor of the soul. May we all understand that salvation is the only hope we have, and when we drift, our only hope will slip away! ​Phariseeism and legalism are often used interchangeably. One might be called either legalistic or a Pharisee if he or she attempts to bind any part of God’s word too forcefully. Naturally, when anyone is offended by an explanation of God’s word it is commonly deemed, “too forceful,” and the person guilty of such an interpretation is legalistic like unto a Pharisee. People who are so easily offended by simple reading of the scriptures are uneducated. They are only offended because they have not read the scriptures for themselves. They are not aware of the actual sin for which Jesus condemned the Pharisees. The Pharisees accused Jesus disciples of sin for healing on the Sabbath, picking heads of grain for food on the Sabbath, and many other areas. Simple minds would interpret Jesus’ condemnation of the Pharisees as to say these menaces were interpreting the law of God too strictly. This is anything but the truth. 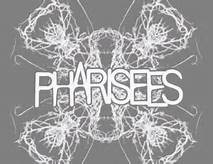 ​The Pharisees’ problem lay in the fact that they advocated parts of the law but did not observe those very laws for themselves. “The scribes and the Pharisees sit in Moses’ seat. Therefore whatever they tell you to observe, that observe and do, but do not do according to their works; for they say, and do not do. For they bind heavy burdens, hard to bear, and lay them on men’s shoulder; but they themselves will not move them with one of their fingers. But all their works they do to be seen by men…” Matthew 23:2-5. The Pharisees were the true definition of a hypocrite. The Pharisees’ other sin was binding laws that were never bound in God’s word to begin with. They made up new laws like Wal-Mart shoppers make up new ways to take advantage of the store’s customer service. In Luke 14, Jesus healed a man on the Sabbath. The Pharisees accused Jesus of sinning. Jesus replied in verse 5, “Which of you, having a donkey or an ox that has fallen into a pit, will not immediately pull him out on the Sabbath day?” Jesus was not claiming the Pharisees were just as guilty as He was. Jesus was not guilty. He was rather accusing the Pharisees of taking the law of God to lengths it was never intended by God. The Pharisees were making up new laws. ​The Pharisees were not little rascals. They were dirty rascals. They taught one thing and did another. They accused men of sin where there was no transgression. When a child of God reads the Bible and warns his friends of their sins, it does not automatically make him guilty of Phariseeism. Jesus also said, “Judge with righteous judgment,” Jn. 7:24. Think before you say, and don’t let false accusers make you fall away.